When may I shred my closed files? How can I avoid disciplinary complaints? What are the keys to an ethically-compliant law firm website? 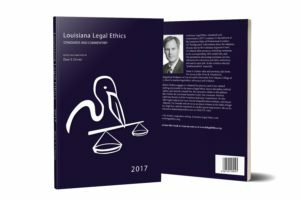 For answers, get Louisiana Legal Ethics: Standards & Commentary (2017), a newly-revised book containing the full text of all of the Louisiana Rules of Professional Conduct plus up-to-date annotations and answers to frequently asked ethics questions.